Striper action this week is about as good as it gets. 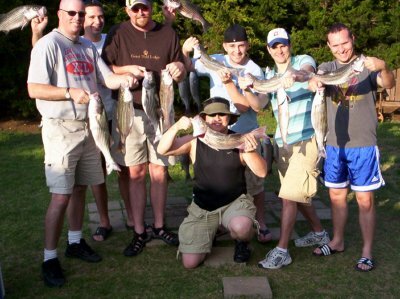 We have been catching early limits of nice box fish – 17" to 19" plus our over 20" Lake Texoma stripers. I'm still fishing live bait as that is what the stripers are keyed in on. I have also caught some slab and topwater stripers this week which goes to show that the Lake Texoma stripers are on the feed and very agressive about it. Right now it seems that everywhere I look I find good sized schools of stripers. 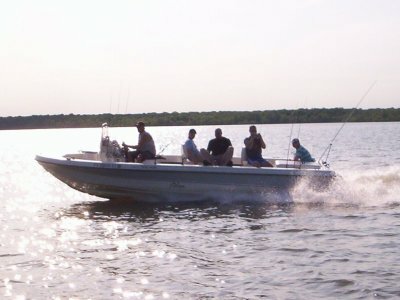 I'm fishing in 55-70 feet of water on anchor, and it doesn't take long for the Lake Texoma stripers to find you and start the feeding frenzy. Some of the stripers have finished the spawn but we are seeing a lot of the stripers who have not. With the influx of water entering the lake and the water level steadily increasing, there is all kinds of floating debris in the lake. I have seen giant tires, huge trees and water soaked logs floating just at surface level. Be sure you are extremely alert and keep an eye on the water ahead of you when underway, these floating obstacles can not only do serious damage to your boat but can also cause injuries to you and your passengers, so please be very careful. With the warmer temperatures the lake traffic has really picked up. Remember the key is SAFETY FIRST. Be sure you have the required amount of floatation devices for everyone in your boat and remember children under 14 are required to wear a life vest when your craft is moving.